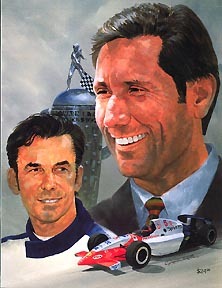 This was the final Indy Yearbook put out by Carl Hungness in 1997. Since 1973 he put out quality books on Indy but his disagreement with the Speedway finally killed the Indy Yearbook series. 1997 was the first year for the new IRL cars so some problems came with the new cars. All in all it was a good beginning for IRL cars with Arie Luyendyk winning his second Indy 500. Stories include Miniature art by artist John Rogers; Racing publications on the market; new IRL engines; Nicole Osborne's aluminum models; Will Stryker metal master; Troy Ruttman bio; riding mechanics at Indy; the bricks of Indy; interview with Leo Mehl; Team Cheever. Plus the normal stories on the race, practice, box scores and starting line-up.